We are going to prepare this dessert so representative of Catalan cuisine: the Catalan cream. In fact, in Catalonia they only call it "crema". It makes sense, right? It is mainly made with egg yolks, milk and sugar, in this case with a caramelized layer on top that gives it its color characteristic and also gives a nickname, it is also known as "cream burned." Cinnamon, lemon and flour complement the ingredients of this dessert. The preparation, as you will see below, is easy. Follow this easy recipe of the Catalan cream step by step, and you will see how your dessert will be perfect and delicious, without complications.As for this recipe we will only need the yolks, we can keep the egg whites in a bowl in the refrigerator, to prepare another recipe (and consume them quickly). We will also leave another ingredient ready to use: lemon. With a manual peeler, remove the shell in ribbons, or as complete as you can. The rest of the lemon will remain intact for use in another preparation (but in the meantime, keep it in the refrigerator). Then, in a bowl, mix the egg yolks with the sugar, until you get a well-integrated paste. On the other hand, in a saucepan, heat the milk and add the lemon peel, with the cinnamon stick. At the time of pouring milk, we will reserve a little in a cup. We will let Milk is heated until boiling, with the fire on medium heat, to make sure it does not burn or stick to the surface of the pot. At the same time, we will use it to dilute the corn starch in the rest of the milk that we had reserved in the cup. We will make the mixture in this way to make sure that the cornstarch does not make lumps in the liquid. Once this step is completed, we will add it to the rest of the milk. After that the milk has boiled, we will remove it from the fire and we will remove the skin of the lemon and the cinnamon stick. Immediately, we will mix it with the pasta that we had prepared before, with the egg yolks and the sugar. After all the ingredients are well integrated, return them to the fire and cook them at low temperature until a creamy consistency is obtained. To achieve this, you will need to constantly remove them with a wooden spatula, which will cause the mixture to become thick, little by little. When you get the desired creamy consistency, remove the mixture from the heat. Distribute it in the individual containers you want to use to serve. If you have the traditional clay pots, so much the better. Another option is to use a single large mold. Allow your dessert to cool to room temperature , before passing them to the refrigerator. Then, keep it cold for a few hours so that it sets. When you are going to serve the Catalan cream, covers each container with a good layer of sugar, and quickly passes the fire of a torch, so that the sugar burns or caramelizes. This will give the characteristic golden color of the surface of this dessert. When you choose the lemon for this preparation, try to get one from your garden or orchard, from a bio store or simply, an untreated lemon. The point is to save a certain amount of pesticides, which could have been absorbed by the skin of a lemon from an industrial plantation. If you want to perfume your Catalan cream in another way, but continue on the traditional recipe, You can change the lemon skin to orange peel.The reason is simple: the film will prevent your desserts from losing moisture. That is why you will see that some droplets will stick to the inside of the plastic. Otherwise, the liquid lost would cause the Catalan cream to dry up a bit. If you do not have a kitchen torch at home, we propose an alternative to caramelize the sugar coating of your Catalan cream. If you have a spatula or large metal cooking spoon that has a handle made of wood or plastic, you can quickly heat it over the fire of a burner and then pass it over the layer of sugar. This way you will make it brown. Some people think that the Catalan cream and the creme brulee are the same . However, that is not true, and we can quickly explain why. 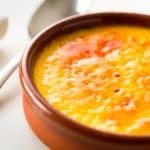 Initially, the most common is that the Catalan cream uses liquid milk as an ingredient, while the creme brulee uses cream milk, or failing that, at least a part of cream. That's why the French do not add cornstarch when they prepare the creme brulee. 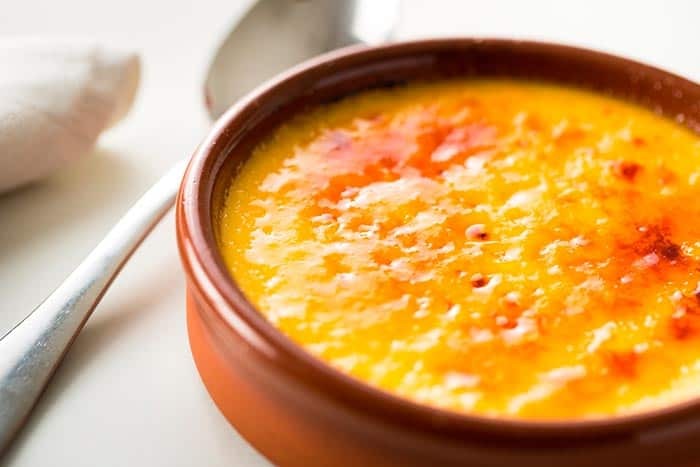 But above all, the most important difference is that the Catalan cream is cooked in saucepans over fire, while the creme brulee is cooked in Bain Marie, baked. However, considering the proximity between Catalonia and France, it would not be unreasonable to have some common point in the history of these two desserts. If you are a lover of Catalan gastronomy, you can also prepare our romesco sauce recipe for calçolts. For more recipes of creamy desserts, you can try our chocolate mousse in 4 steps, this recipe for white chocolate mousse or this strawberry mousse.